A week and a half ago I went to the LA Times Festival of books with my daughter Jessica, my son-in-law Roy, and my “adopted” son Antonio. We hadn’t been to one of these in years but decided to make the trek this year from the Fresno area because my daughter’s favorite author, John Green, was going to be speaking there. The last time we went to this event several years ago, it was held at UCLA, but it is now at the University of Southern California. I forget sometimes how books bring people together. We found ourselves surrounded by people with the same love–even if we didn’t all enjoy the same books. Book people are great! 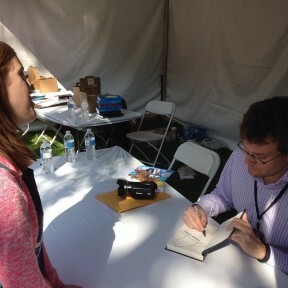 People were friendly, and helpful, and when you found that you loved the same books–like in the line to see John Green–you quickly became friends and spent the entire hour and a half in line waiting to hear him speak, gabbing about how much you love John Green. It was a wonderful experience. I even connected with a fellow reporter and author, Jenny Lynne, who has a fun website about Bucket Lists! She asked John for his and you can check out his answer here: mydreamcametrue.com/johngreen. For those not familiar with John Green, he writes Young Adult novels. One of his books, The Fault In Our Stars, is being made into a movie which will be released in June. One of the wonderful things about his writing is that his books don’t just appeal to young adults–as evidenced by the varied ages we chatted with in line for the event. The 1200 seat building was packed, with probably hundreds more people waiting on standby–whom I’m guessing made their way over to the booksigning line early when they didn’t get in because that line was already long after we heard him speak. So far I’ve only read his YA mystery, Paper Towns, which was nominated for an Edgar. But now that I have seen him speak I plan to read more. John was engaging, interesting, intelligent, humble and entertaining. Sometimes when you hear an author speak and meet them, you walk away having decided you will never touch their books no matter how good they may be because of the author is rude and egotistical, and sometimes just plain jerks. On the other hand, authors like John make you almost feel guilty that you haven’t read more of his books because he’s just such a nice guy. John is also known for his YouTube videos–which are MANY and come in many different forms. I’ll let you check those out for yourself–as I now plan to check more of them out as well. This is what so many authors don’t get–the type of person you are matters. If you can make people fall in love with you, which obviously John Green has, than they will fall in love with your books as well. After the talk, my kids went on to wait in line for THREE AND A HALF HOURS to have him sign their books! And they weren’t even at the end of the line. I have to say I was also impressed that John made it clear he’d stay and sign books as long as he needed to–now that’s class! While they were waiting in line, I took the chance to hop over to the area where all the mystery booths were located and had a blast seeing old friends, making new ones, and doing several video interviews with mystery authors–watch for those over the next few weeks, starting with this week’s of Jeri Westerson, author of the Crispin Guest Medieval mystery series (at the end of this post). I also got myself an awesome pair Sherlock Holmes earrings! While I wish we could have stayed for both days, the day we went was packed with great fun and well worth the trip! We also enjoyed both our meals in this great little on campus food court where we had The Habit and California Pizza Kitchen. There were also food booths and food trucks. And of course tons of book related booths to check out. It’s a lovely campus and I plan on being back next year for both days! If you love books, I highly recommend going next year. Thanks for the report, Lorie. Sounds like a wonderful event.